Which Thompson Pressure Regulator Valve Is Right For You? Thompson Valves have a regulator for every application. But which Thompson pressure regulator is right for you? In this blog, we take you through the top Thompson pressure regulators in the Fluid Controls range, to help you find the most suitable product for your specific application. Are you looking for a spring-loaded Thompson pressure regulator? We have several innovative products for you to choose from in your search for the ideal regulator for your application. Below, we feature a selection of our spring loaded pressure regulators. For the full range, visit our website. The J20 is a 1/16″ unbalanced spring loaded regulator that is designed specifically for use with gases, but can also be used with liquids. The J20 Thompson pressure regulator is perfect for applications with low to medium pressure that require quick control of outlet pressure. accurate and economical regulator features base mounting, manual adjusting, a locking device and a limit stop device. 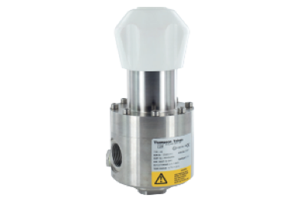 The J20 Thompson pressure regulator can be used for a wide range of applications, such as chemical processing, air compressors, gas mixing and oxygen service to name but a few. Also in the Thompson range is the J45 1/2″ balanced regulator. If your application requires heavy-duty, medium to large pressure control, the J45 could be the perfect pressure regulator for you. For use with both liquids and gases, the J45 offers manual adjusting, base mounting and a robust design. For marine, oil and gas, offshore and aggressive industries, the J45 Thompson pressure regulator really comes into its own. The J46 3/8″ unbalanced regulator is designed for use with liquids and gases. This diaphragm sensed regulator offers quick control for outlet pressure and, due to its manual operation, is an extremely reliable and accurate spring loaded regulator. It features a locking device, the option for non-relieving or relieving and panel mounting brackets. The J46 has been manufactured specifically for low to medium pressure applications, such as chemical processing and gas mixing. Dome-loaded back pressure regulators from Thompson are perfect for applications requiring quick and accurate control of inlet pressures. Choose from a selection of sizes to suit your application’s requirements. This range of unbalanced dome-loaded regulators is ideal for low to medium pressures with a high flow. Featuring a heavy-duty, stable construction and a noiseless body, Thompson dome-loaded back pressure regulators are suitable for a wide range of demanding environments. If you require assistance from the team at Fluid Controls to choose the right Thompson regulator for your application, please get in touch. Call +44(0)118 970 2060 or email fluid@fluidcontrols.co.uk today.